The Nelson Rigg Adventure Dry Bag features a roll top closure to ensure your gear stays bone dry on your cross country exploits. Two lashing points per side enable longitudinal or transverse mounting. Have owned NR covers, and always had good luck with them. Previous experience with Nelson Rigg products. Plus we just bought bike covers at Americade. I've only used this bag once so far, but it performed flawlessly. It holds a lot of clothes and things and keeps the weather out very well. Largest bag I could find that would fit by Vstrom without looks silly! waterproof, right size for camping gear, and it can be secured to the bike firmly. I needed more space for long trips and have tried the type with a rain cover, they either rip or fill up with air and everything gets wet. This will fit nicely on the back seat of my Goldwing, or on the rear trunk rack if my wife is along. SIZE, COLOR OPTIONS AND GENERAL DESCRIPTION OF BAGS QUALITY OF MATERIALS. So that I could put more stuff on the back of my FJR than would fit in the factory top case. Spacious for long haul stuff and waterproof! Bring on the open road! Is there anyway to lock the bag? Maybe a luggage lock on zippers? BEST ANSWER: The Nelson Rigg Adventure Dry Bag folds over and attaches with buckles, so there is no zipper to lock. 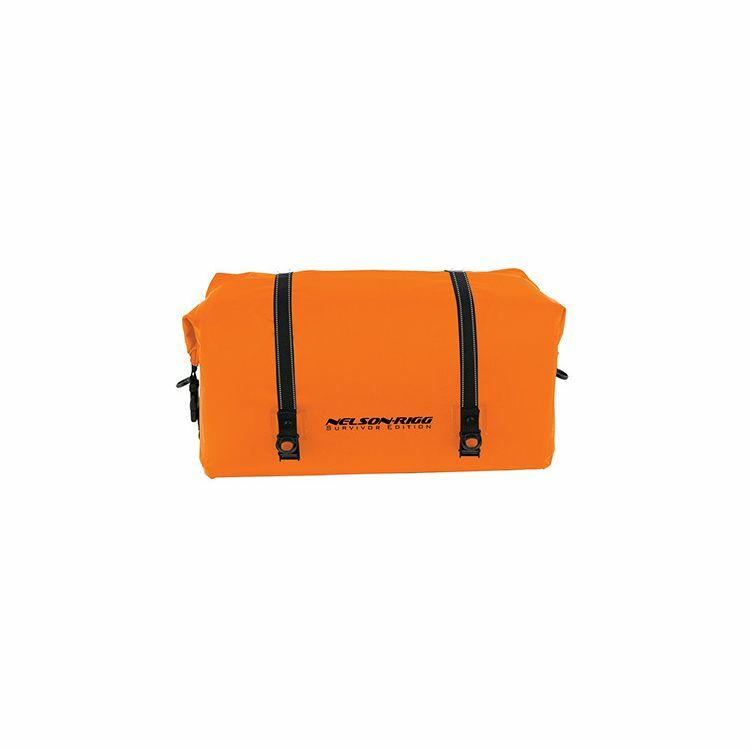 Dry bags, once secure, are hard to get into, but I don't know of a way to lock them other than a cable around the bag, which would keep anyone from unfolding it and getting in. I think the bigger risk would be someone removing the whole bag from the bike, so a cable lock is definitely a good idea. There is not a way to lock this bag. There are no zippers or metal parts on the bag on which to fasten a lock, nor can you lock the bag to your bike. The only way I can think of securing it would be to own a locking cover for the entire bike. Even if you could lock it, any thief could slice open the bag with any blade. There is no way to lock it securely. The bag has no zippers and locking the buckles to each other reduces the capacity to useless. You roll the bag closed and that closure is about 20" and very flexible. I really don't think there's a way to lock it. But remember , just a couple of snaps and you can take it with you. If you roll it right a covered lock cable and lock should attach it to the bike quite well. There is not a way to lock the bag. No zippers are present. If someone wanted in the bag anyway, they could cut through the material. Bag works great to defeat weather, but not thieves, unfortunately. I can't think of any. It's a good bag though. Waterproof. I highly recommend it. This a roll-down top dry bag; so no zippers to put a lock on. I have a 2010 Z1000 with a fender eliminator kit, so the rear is completely open. I could attach the bag to the frame on the front, but do you know how I could attach the bag in the rear? Is this compatible with my bike? BEST ANSWER: Likely not, it needs 4 attachment points to be stable, and its long enough that you would have to mount it too far forward to get the front and rear straps hooked within the length of the rear seat. The internal reinforcement is really just a thin piece of plastic or stiff cardboard in the base of the bag that stiffens it up a bit. Also, even with the rear fender still on the bike, I'd question whether that all-plastic extension is stiff enough to serve as safe rear attachment points for the bag. Think you'd be better off with something more square-shaped. Hi, I have not used the bag yet, but I did mount it on my bike. I have it on the pillon seat, straddling the Jessie pannier, so that works fine. The bag comes with a fairly firm bottom and 4 fixed strap receptors/claps, one at each corner at the bottom. You have some freedom as to where or how you route the straps and than attached them to the fixed clasps. I cannot envision you bike setup, but if the bag sits on a firm substructure, the straps could all come from your rear frame into the claps, I presume. I hope this helps. The bag attaches with nylon straps that are looped at one end. You need something that they can loop around. They are really long so you could possible put them around the license plate bracket or even around the entire tail section, but that might scuff up the finish. The bag works really well, with the give to accommodate odd sizes, but mine never looks as tidy as Rigg has it pictured. Sorry,don't know how it would mount,I use mine on a H/D ultra,but I can tell you it's an excellent bag and has perfomed great in some heavy ,long downpours. Does this bag have any carry handles or a shoulder strap? BEST ANSWER: No handles and the shoulder strap is not really usefull. I think it is not meant to be used for carrying this bag around, i think it is a great waterproof product for long distance ridding, the straps to hold this to the bike are well done and hold it perfect when ridding. Test the bag travelling in south america. Good luck. From Buenos Aires, Argentina. No carry handles but it does have a shoulder strap. I will say while this is an excellent bag (I have used it in downpours w/o any issue), the shoulder strap is quite narrow and tends to cut into your shoulder if there's lots of weight in the bag. But this is a great bag and I highly recommend it! Yes. It comes with a shoulder strap. Just used this bag in a trip to a VStrom rally in N.C. and back. Poured the entire way back (3 hours). Not a drop of moisture inside. Holds LOTS and love the way it both secures, and ties down. I'd buy it again in a heartbeat. Is this bag rigid enough to be loaded half way and still be stable? BEST ANSWER: Bag is not rigid. When half loaded, it is easily rolled down and secured without flapping. Bottom panel is semi-rigid, so bottom holds it's shape well. Great bag! We load ours fairly full & it's very stable. It really helps give us a lot of extra storage for long trips...well made & easy to use. Highly recommend it! I think so. I have used it with varying amounts of gear. I just roll it down so it's tight. I have 2, great bags. Yes--the removable stiffener in the bottom of the bag is pretty rigid. Will not be a problem. Is the firm internal base removable? BEST ANSWER: Yes, it can be removed which is what I ended up doing to better be shrunk down to better fit the tail of the bike. Sorry, I sold the item and I do not recall whether the internal base was removable. Yes, it slides in a sleeve.